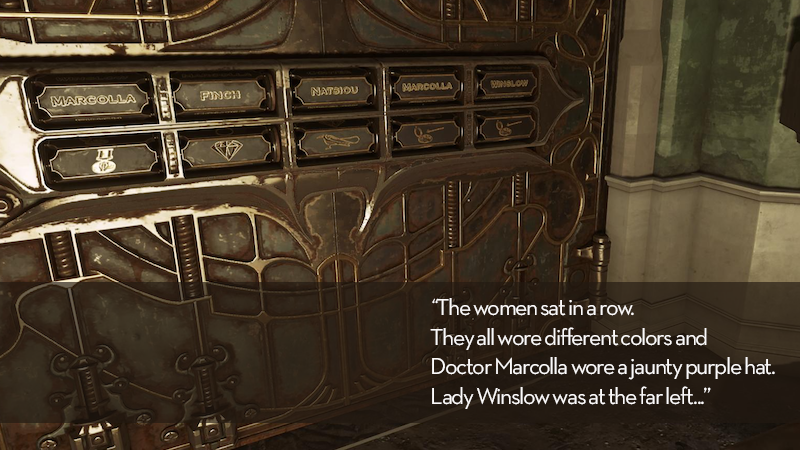 Dishonored 2 is a game about sneaking, stabbing, and teleporting around behind enemy lines. It’s also occasionally a game about solving thorny LSAT-style logic puzzles. Now, some context: It had been a few weeks, and I had more or less completely forgotten what I was supposed to be doing in this level. I play with quest objectives turned off, so I didn’t remember that I had the option to go and do some sidequest to get some NPCs to open this door for me. All I knew was there was a big door in front of me and it could be opened by solving a logic problem. (I assumed that the puzzle was optional, of course.) Furthermore, I had coincidentally just had a conversation about how much I like these kinds of puzzles. I took it as a sign. I was gonna solve this bad boy. I did eventually solve it, though it took me about 30 minutes and two full sheets of paper to do so. Before we get into the solution, I want to see if you can solve it, too. Maybe you’re on your lunch break? Maybe you don’t want to play Dishonored 2 but you love logic puzzles? At the dinner party were Lady Winslow, Doctor Marcolla, Countess Contee, Madam Natsiou, and Baroness Finch. The women sat in a row. They all wore different colors and Doctor Marcolla wore a jaunty purple hat. Lady Winslow was at the far left, next to the guest wearing a white jacket. The lady in green sat left of someone in blue. I remember that green outfit because the woman spilled her whiskey all over it. The traveler from Fraeport was dressed entirely in red. When one of the dinner guests bragged about her Diamond, the woman next to her said they were finer in Fraeport, where she lived. So Baroness Finch showed off a prized War Medal, at which the lady from Dabokva scoffed, saying it was no match for her Bird Pendant. Someone else carried a valuable Ring and when she saw it, the visitor from Dunwall next to her almost spilled her neighbor’s wine. Countess Contee raised her rum in toast. The lady from Karnaca, full of beer, jumped up onto the table, falling onto the guest in the center seat, spilling the poor woman’s absinthe. Then Madam Natsiou captivated them all with a story about her wild youth in Baleton. In the morning, there were four heirlooms under the table: the Diamond, Snuff Tin, the Bird Pendant, and the Ring. So you’ve got five ladies and five heirlooms. In order to get the correct input for the lock, you need to arrange the ladies at the table and assign them each to their heirlooms. Seems straightforward, right? Go for it. I’ll wait. I had no idea about this puzzle going in. Turns out it’s kind of a thing among fans of Dishonored 2, in part because the puzzle is randomized, so you can’t just google the solution. You can get the coveted “Eureka” achievement/trophy for solving it outright, though you can also find clues in a nearby building and even find the solution later in the level if you can get an NPC to let you bypass it. However, if you do that, you won’t get the achievement. Players have come up with custom worksheets to quickly solve the riddle, and speedrunners have taken to diagramming the possible permutations so they can more quickly decipher it. That’s because in a speedrun, if you can get the door open quickly, you can bypass a huge chunk of the level. I didn’t know about any of that, so I just rolled up my sleeves, broke out a couple sheets of paper, and solved the fucker. Which made me feel like THE SMARTEST MAN ALIVE. Above: A sampling of my long-atrophied handwriting. So basically you have five variables: name, outfit color, hometown, beverage, and heirloom. You need to use all of them to solve the puzzle, because only through process of elimination and association will you have enough information to determine who’s sitting where, and who has which heirloom. The hardest thing for me was figuring out how to arrange the information on a piece of paper as I worked it out—I went through a few drafts where I’d start listing things before realizing that my layout wasn’t going to be able to support the different kinds of information I had to associate. I tended to think in terms of positives (“Countess Contee is drinking rum”) and not be able to organize my negatives, since some of them are so specific (“The woman in blue cannot be next to Lady Winslow”). I eventually figured out a system that worked. I’m sure it would’ve been much easier with a spreadsheet, but I don’t think Emily Kaldwin had Excel on hand, so I decided to keep it setting-appropriate. My other major stumbling block came from what I see as a borderline flaw in the wording of the puzzle. In one crucial place, the language is a touch unclear: “Someone else carried a valuable Ring and when she saw it, the visitor from Dunwall next to her almost spilled her neighbor’s wine.” The words “her neighbor” are ambiguous to me: they could refer to the Ring-holder, or they could refer to the visitor from Dunwall’s other neighbor. Was I supposed to use that sentence to determine a fact about the woman with the Ring? This was a source of much consternation as I drew closer to the solution. I was eventually able to chew my way around the ambiguity, but I frequently ground my teeth at whoever wrote that sentence. The solution, as you can see in that picture of my worksheet, is as follows: From left to right, Winslow had the ring, Contee had the Diamond, Marcolla had the Bird Pendant, Natsiou had the Snuff Tin, and Finch had the War Medal. I entered my findings into the lock and—click!—it opened. Hell yes. Thus ended an unexpectedly rewarding interlude in Dishonored 2. I’m curious how many of you got it done. If you got to this puzzle in the game, did you solve it? If you haven’t played the game, did you solve my version? And most importantly, do you think Lady Winslow wore red because she was worried about spilling her wine, too?